Calling all String Players! Come and play with us — the Second Street Musicians! We are violin, viola, ’cello and double bass players of varying ages, backgrounds, and skill levels who come together in classes for ten weeks in the fall and ten weeks in the spring to share the challenges and camaraderie found in playing beautiful and interesting string orchestra music. There are no auditions — based upon experience and skill level, members either attend the afternoon class designed for more advanced players or the morning class designed for beginners and re-starters. We meet on Saturdays on Second Street at Trinity Church in Ashland. Classical music is our primary choice but we also find enjoyment in folk songs, show tunes, and alternative styles. Second Street Musicians is a non-profit 501(c)3 organization with a volunteer governing board. 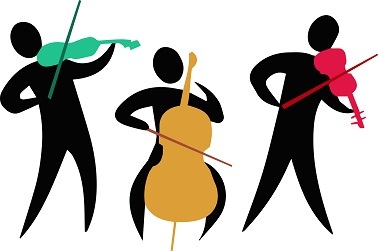 Supported by tuition fees and fundraising, the organization is dedicated to providing members with professional instruction and an enjoyable opportunity to learn or refine the art of playing string instruments in a chamber or orchestral setting. Good friendships, as well as good music, are the hallmark features of the group and the framework is one of relaxation, enthusiasm, emphasis on excellence in music, skills improvement, and good humor. We encourage each other’s learning and ensure that each person feels valued. We are always looking for string players to join us! Instructor: Patricia Potter, M.Ed. is a free lance violinist/violist, private teacher, an adjudicator for music festivals, and a past performing member of the Rogue Valley Symphony. She is also a certified Oregon Public School Orchestra teacher and a current board member for the Oregon chapter of ASTA (American String Teachers Association).